Text description provided by the architects. Sá da Bandeira’s building was our first project in the Porto downtown context, having been in standby for several years, its construction began five years after the project was started. This waiting period proved to be fundamental in the outcome of the project since it contributed to a reflection on how to project in a preexistence. The initial project affirmed in a very radical way the relationship between the existent and the new, intention that lost force as the construction moved on, ending in a much more sensible and discrete exercise that almost annuls the presence of the architect in the final result. Sá da Bandeira’s building, although having all the typological characteristics of the 19th-century Porto downtown residential buildings, has never really been inhabited, and has always functioned as a commercial and service building. That explains the way the interior space was subdivided and changed. Still, it preserved intact the constructive and decorative elements of the original construction, the wooden structure (floors and roof), the skylight with an oval shape, most of the carpentries like skirtings, banisters, interior doors, and doorways. The challenge was to remodel the building inwardly and expand it on one extra floor, enabling the installation of six apartments, four of typology t1 and two of typology t2 duplex, keeping the commercial space on the ground floor. 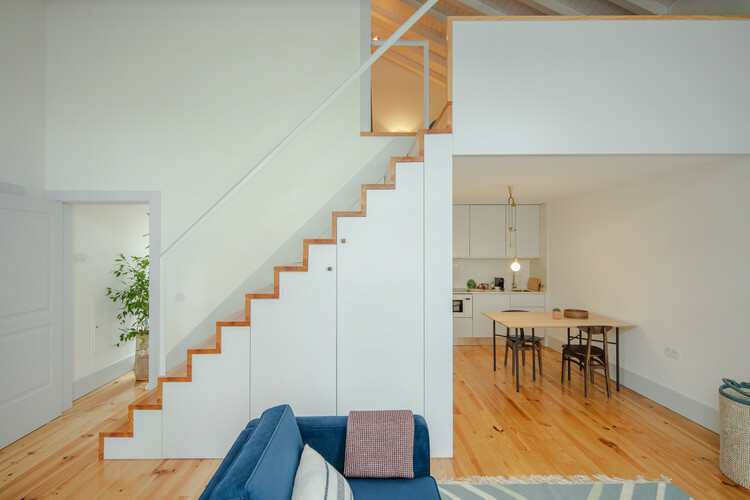 The excellent state of the vertical circulations, of the structures and the floors, was the starting point for the type of intervention that was more of restoration than remodeling. So, once the staircase is in the center of the plant, a “front/rear” solution was designed, creating two apartments per floor. The interior distribution reinvents the alcoves common in this typology, in order to integrate the new parts, kitchens, and sanitary facilities. Regarding the constructive and finishing hierarchy present in this family of buildings, the spaces and details are simplified as we go up in the interior. From the romanticism of the 19th century evident in the 1st and 2nd floors a much simpler language is succeeded on the 3rd floor (enlargement). Decorating and furniture elements reinforce the romantic vision of the building, creating a whole that is intended contemporary, contextualized, eclectic and strongly emotional.